Nothing is better than catching your furry best friend in the act of a terrible rampage of destruction and seeing the half innocent, half ashamed look on their faces. Perhaps they destroyed your favorite pair of shoes, ransacked your sock drawer, or TP’d your entire house. Whatever it is they got into this time, it’s not the first time and it most likely won’t be the last for some trouble makers. Although a flash of furry races across our minds, we see their sweet guilty faces that scream, “What have I done?! I don’t remember it at all! What is liiiife?” and we decide to forgive them soon after. They want to do right by us and make us happy and they typically accomplish this but every once in a while, when we’re least expecting it, they lose sight of their love and get way too excited, happy, or anxious and completely destroy everything! What would we do without our little Tasmanian Devils, though? Life would be far too neat and monotonous. 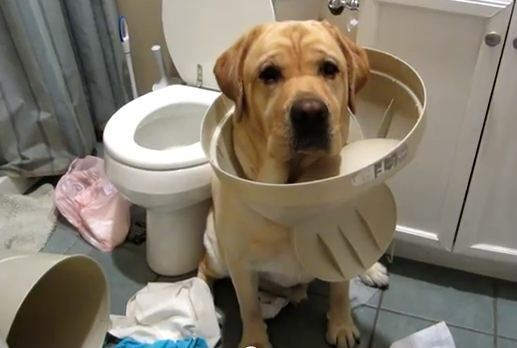 These next 30+ animals who have no idea where the mess came from, will give you a good reminiscent laugh of just how ridiculously guilty and adorable they can look when they get caught in a bout of destructo-rampage-tornado-behavior. Cheers to guilty animals and the chaos that seems to follow them. This guy is having a hard time finding an alibi.